This is a second visit from this Lancastrian duo. Nick and Ed brought us selection of songs both ancient and modern last time. 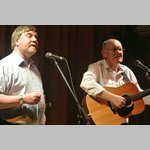 They are no strangers to the folk scene as they both served their time in successful groups in the past. Their voices blend well together and Ed’s guitar playing completes the sound. Nick is a fine ballad singer in his own right so all in all you are in for a treat.